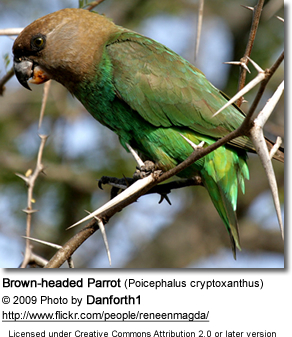 The Brown-headed Parrot (Poicephalus cryptoxanthus) is endemic in Southeastern Africa, from Swaziland, Zululand and Natal across northeastern Transvaal north to southern Mozambique and southeast Zimbabwe. They are found in almost any woodland within the forest savannahs and the dry woodlands. They prefer baobab trees. These gregarious birds are usually seen in small flocks of around 12. At favored feeding places, flocks of up to 50 may congregate. Even though this species is endangered in its natural habitat (CITES II), the Brown-headed Parrot are popular in aviculture. Brown-headed parrots generally have a sweet temperament. These relatively small parrots also tend to be a quieter than other parrot species, making them a good choice for apartment dwellers. They are energetic, outgoing and generally quite affectionate, although they do not crave attention, as some other parrot species do. They tend to become more independent as they reach maturity (when they are about 2 - 3 years old). Mature males may show aggression during the breeding season. They can learn to perform tricks and, provided they were well socialized, enjoy being handled. Their playful nature is quite entertaining. Young birds should be socialized to many people and exposed to new experiences to avoid fear of new situations. Adult parrots are less adaptable to unfamiliar environments. They can live up to 30 years, provided good care is given. However, most live only 15 to 20 years. Some Brown-headed Parrots may learn to talk (some are more talented than others) -- but, generally speaking, their talking ability is considered moderate. Although they are very good at mimicking sounds and whistles. These active parrots require as large a cage as possible. At a minimum, the cage should be of the following dimensions: 4 ft x 4 ft x 4 ft or 3 ft x 3 ft x 6 ft, with 5/8" or 3/4" bar spacing. The cage should have at least two perches, so that they can move between them. Ideally, an outdoor cage / flight should also be provided so that these parrots can enjoy the health benefits of natural sunlight and fresh air (weather conditions permitting). Ideally, pet birds should have an outdoor cage to provide some sunlight and fresh air in good weather. They should be provided with plenty of toys to entertain them both in and out of the cage. Daily out-of-cage activities should also be available for exercise and mental stimulation. Toys and activities should be provided. The type of toys they generally enjoy are wooden blocks and branches from non-toxic trees to satisfy their need to chew. Bathing or showering is vital to maintaining good plumage and healthy skin condition. They can also be misted and allowed to dry in a warm room or in the sun. There are as many arguments for clipping a bird's wing, as there are arguments against this procedure. If the owner chooses to clip a bird's wing, please note that injury can occur when the wings are clipped too much. These heavy-bodied birds will drop to the floor like a stone, potentially resulting in serious injuries, such as a broken chest bone. This can be avoided by clipping only enough to still allow a bird to glide to the floor. The differences are however slight and some sources consider this species monotypic (one single species). The Brown-headed Parrot averages 8.5 - 9 inches (~22 cm) in length and has a wing length of about 5.5 - 6.5 ins (145 - 165 mm. They usually weigh between 115-125 grams. The plumage is mostly green, except for the greyish-brown head and nape (back of the neck), which turns green on the upper back. The lower back is pale green. The breast, abdomen and under tail-coverts are pale green, with faint blue marking in some birds. They have bright yellow markings under its wings, which are visible only when the birds are in flight. These markings may also be seen in some birds where the thighs join the body. The outer webs of primaries (longest wing feathers) are blue. The tail upperside is olive-brown with green edging and tips. The underside is grey. The adult birds have greyish-yellow eyes with grey periophthalmic (eye) rings. Juvenile birds have brown eyes. The upper beak is grey with pale base. The lower beak is pale horn-colored. The feet are grey. Immatures as adults, but generally duller. The head, nape (back of the neck) and upper breast with olive-yellow tinge. Their irises are dark brown but lighten to a pale greenish yellow as they reach adulthood. The lower beak and cere (fleshy area above the beak) are pink. Similar in color and shape to the Niam Niam Parrot - but smaller in size and they can also be identified by its greyish-yellow irises - while the Niam Niam Parrot has reddish irises. Their natural diet consists of various fruits, berries, figs, nuts, seed, as well as buds, shoots and flowers. They are sometimes crop pests. A captive diet should be as close to their natural diet as possible. A high quality seed / nut mix; as well as fresh fruits, veggies and greens should be fed. Fresh water for both drinking and bathing should be available at all times. Brown-headed parrots that are kept indoors especially tend to develop signs of calcium deficiency, which can be a serious health threat. Natural sunlight or full-spectrum light are often helpful in treating the condition; and also has shown effectiveness in stopping feather picking (which may be a result of calcium- or other nutrient deficiency). Please refer to the article about Calcium Metabolism in Birds. Breeding season usually from April-October - depending on locality. Some prolific birds may breed year-round. Usually nest in tree cavities. If available will use old woodpecker nests high above the ground. Captive birds will breed well in a vertical nest box with the following dimensions: 10 inches x 10 inches x 12 inches or, alternatively, L-shaped nest boxes are also accepted. 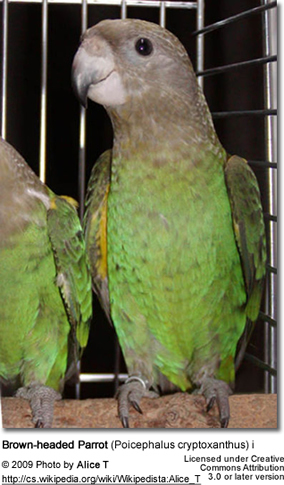 Brown-headed parrots breed well in captivity.